Many protesters’ faces were set in a grim likeness, smiling-but-not-smiling, a kind of general resignation that this day, like so many others before it, might simply be another day of disappointment for all. 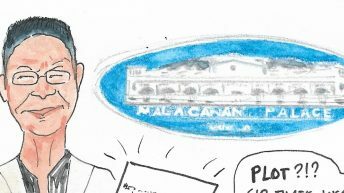 MANILA – “Ang init,” Kuya Mark remarked as he soldiered on through the heat with his placard held high and his head set straight. 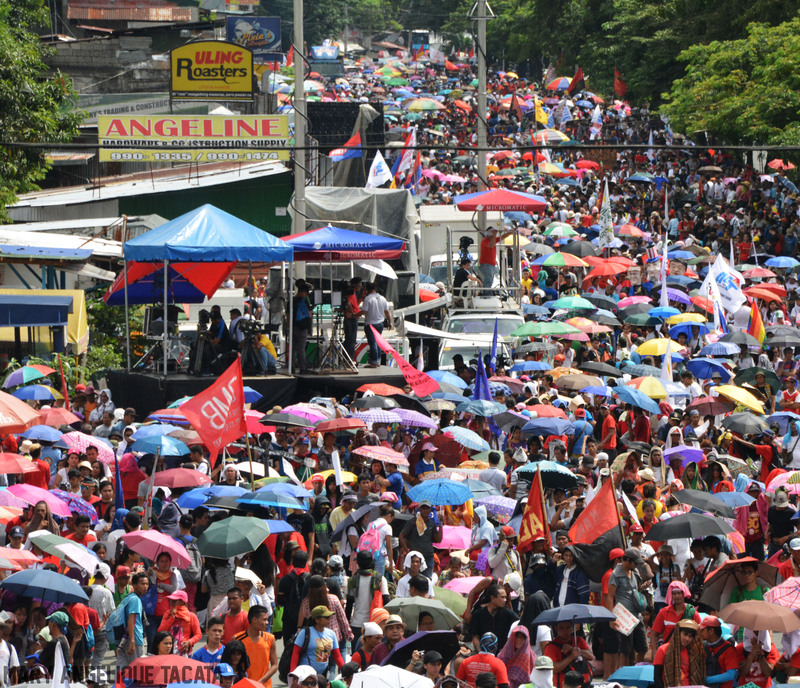 Some 40,000 marchers and their accoutrements – transports and supply jeepneys, vans, and the like – filled a huge chunk of Commonwealth Avenue and the whole length of Batasan Road from Sandiganbayan up to the stage set up in front of the Batasan Hills National High School. The prevailing mood seemed to be cheerfulness, as many marchers could be seen smiling and joking with their buddies and fellow marchers. 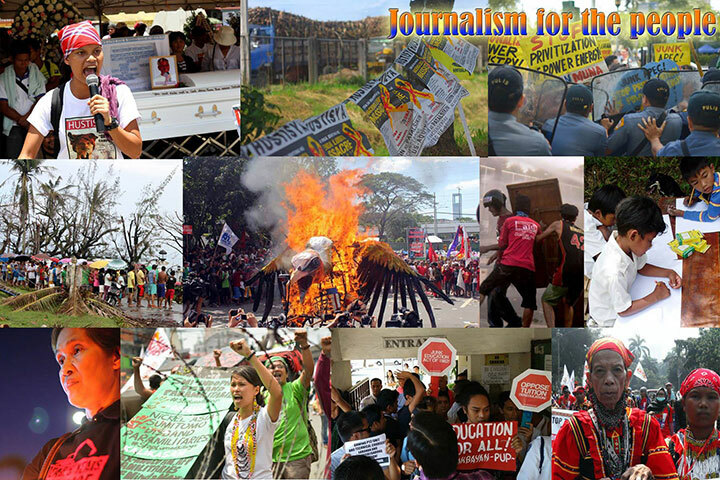 The stifling noon heat – and later, intermittent rains – did not seem to deter the marchers and their programs any, as they used placards and tarpaulins, clothes and notebooks and anything that could be used as makeshift shade and umbrellas to shield them from the elements, all the while snickering as they did so. “O di ba, multi-purpose ‘to,” boasted one of them, and his companions laughed. But there seemed to be another feeling floating around, too, in the way that many protesters’ faces were set in a grim likeness, smiling-but-not-smiling, a kind of general resignation that this day, like so many others before it, might simply be another day of disappointment for all. 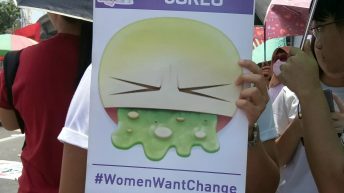 Many protesters, despite their general cheery mien, admitted to feeling more than disappointment at the Duterte administration. Jocy Lopez, chairperson of Kadamay-North Triangle, said she was “angry” and felt “let down” by the Duterte government. 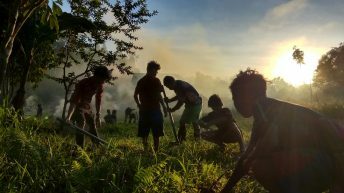 She lamented that Duterte seemed to be only paying attention to the ongoing conflict in Marawi City, but not on the plight of urban poor communities. Danny dela Fuente, 68, National Coordinator of Samahan ng mga Ex-Detainees Laban sa Aresto at Detensyon (Selda), said he felt somewhat disappointed because all that Duterte seemed to have done in his first year was to hasten the implementation of the Human Rights Victims Reparation and Recognition Act of 2013, of which he was a beneficiary, being a detainee during the Martial Law era of dictator Ferdinand Marcos for four years. He bemoaned that only 4,000 of the applicants eligible to receiving reparations were given the money they deserved, and only P12,000 ($240) out of the promised P25,000 ($495)were given to them. 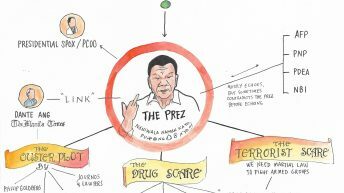 He also decried the continuing imprisonment of at least 392 political prisoners, some of whom are consultants of the National Democratic Front of the Philippines (NDFP) and should thus be protected by the Comprehensive Agreement on the Respect for Human Rights and International Humanitarian Law (CARHRIHL). 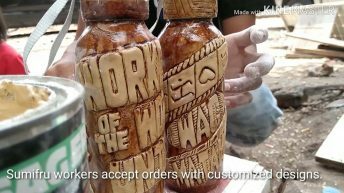 These feelings manifested in the groups’ burnings of effigies depicting their opposition to Duterte’s bloody war on drugs and what they saw as his increasingly fascistic side. 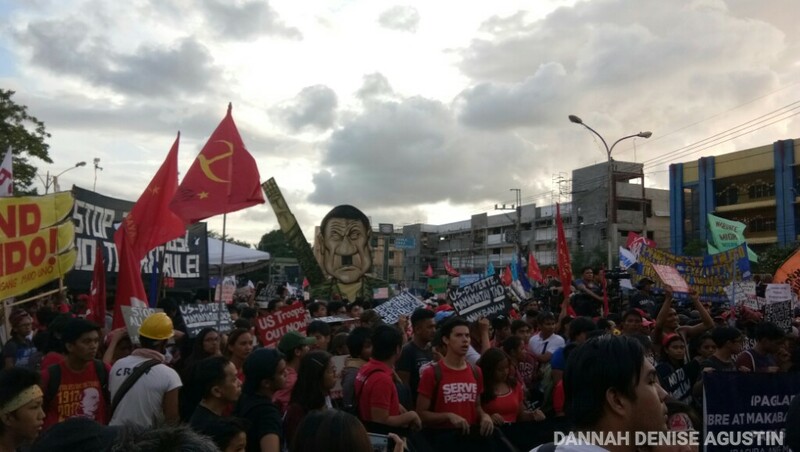 A group burned down a huge effigy depicting Duterte wearing military clothes and a cap with the word “Pasista” emblazoned on it while holding on to a missile they dubbed Martial Law. One protester dressed up as the Grim Reaper, wearing a Duterte mask to show how the President seemed to be to so many Filipinos, with the thousands that had been killed under the Duterte administration war on drugs, which often seemed to target only the poor. Later, the giant Duterte plywood effigy depicting his “leftist” and “fascist” sides were torn down by angry protesters. What little violence happened throughout the whole afternoon came from brief scuffles between protesters from the transport sector, who were threatened with the phaseout of jeepneys, a project started by former President Noynoy Aquino and now being continued by Duterte’s officials in the Land Transportation Franchising and Regulation Board (LTFRB). 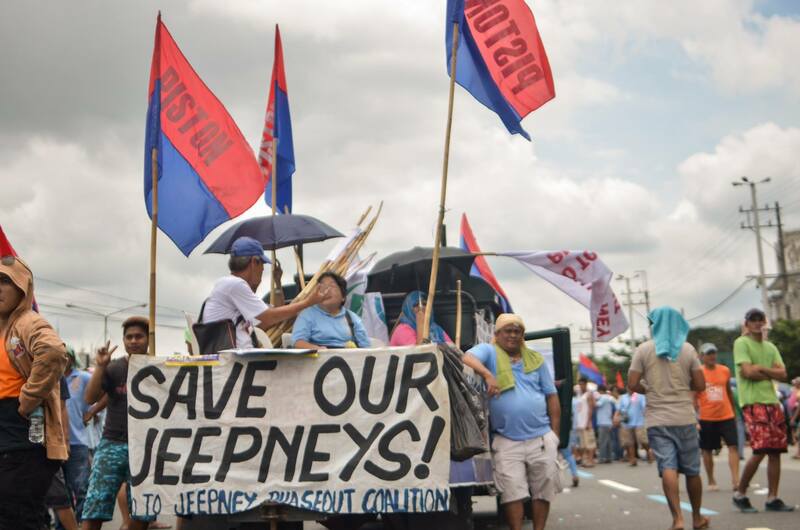 Some of these protesters – jeepney drivers themselves – hounded jeepney drivers passing by Commonwealth Avenue, throwing rocks and sandals at them, exhorting them to “fight with us, for all of us.” Some even accused the drivers of being too complicit with the whims and fancies of the government, and thus to blame for all jeepney drivers’ situation. “Mga buwaya kayo,” screamed one protester, throwing one of his slippers at an oncoming jeepney. “Nakaka-traffic lang kayo,” came the shouted reply of the jeepney driver as he slowed down his jeepney, honked his horn and with one hand gave the middle finger to the protester. “Dapat rehabilitasyon lang, hindi yung phaseout ng jeep… ‘Di naman kami tutol sa modification, sa modified eh, kaya lang sana, tinawag nila ng public hearing sabay pinaalam sa tao,” said Henry Villaluz, 53, a jeepney driver plying the Marikina-Pasig route every day. Villaluz said Transportation Network Companies (TNCs) like Uber and Grab are hurting small operators like them, and along with privately-owned vehicles make traffic more intense. “Sana yung gawang Pinoy ang tangkilikin, hindi yung mga basura ng ibang bansa dito dadalin,” Vilaluz said angrily. This was a sentiment shared by Jeffrey Cioco, 36, another jeepney driver plying the route from Binangonan, Rizal to Jose Rizal University (JRU) and nearby Ortigas Center. “Kung matuloy ang phaseout na ‘to, maraming mawawalan ng trabaho na driver. 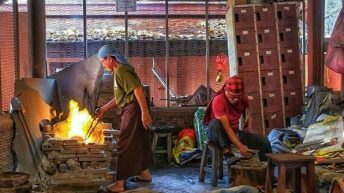 Di rin naman kami marunong mag-construction, ito lang alam naming trabaho,” Cioco lamented. Tensions flew in the air too between the marchers and a smaller gaggle of pro-Duterte groups who were holding their own “pro-Duterte rally” near Sandiganbayan building, just outside the entrance to Batasan Hills, with shouts of “Umuwi na kayo!” echoing from both sides. None of them came to blows over it. Residents along Batasan Road rushed out of their houses to bear witness to the protesters’ march. Many were children, and they watched spellbound as the large effigies of Duterte passed by. 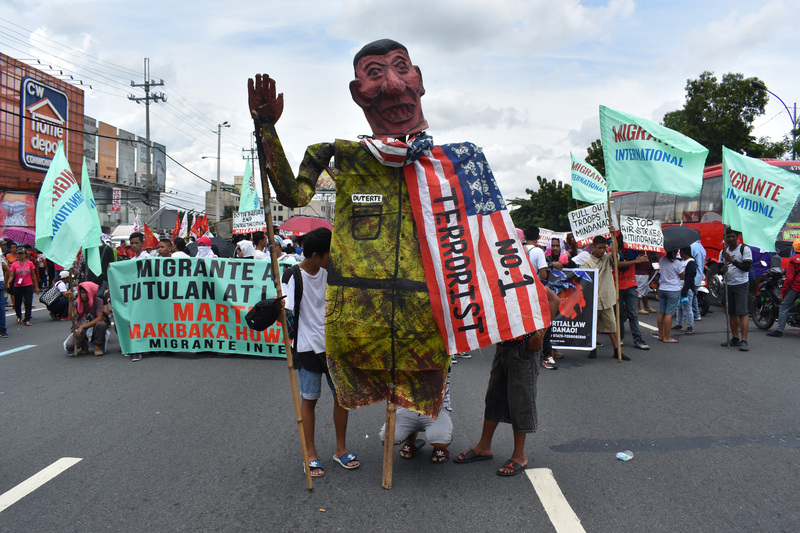 a large effigy of Duterte cross the street. Street vendors started popping up around Batasan, too, peddling everything from buko juice to popcorn to keychains and even clothes and hats. By the end of the day, many had probably made a killing in profits, such as ice cream vendors. Many protesters – even during the march and after they had settled down to listen to the programs – appeared worried, and kept glancing over and over at the rows of policemen stationed along the sidewalks, standing tall and proud and, for many protesters, somewhat threatening in their crisp uniforms. How could they not be wary? 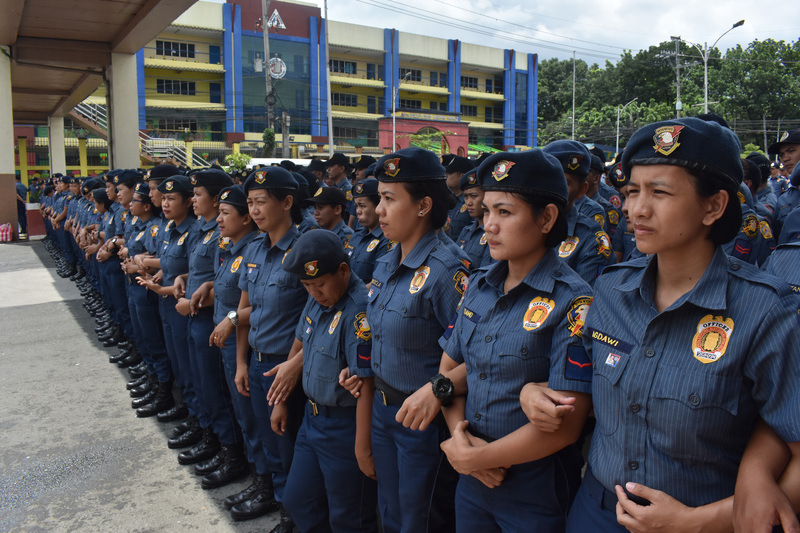 In the years before Duterte, these police personnel were the bane of their rallies, with their wooden batons and truncheons and riot shields and tear gas and fire trucks ready to hose protesters with jets of water. “Ayan na naman sila o,” a protester remarked. But there was to be no violence between the two parties this year. The police, like in last year’s SONA, met the protesters not with weapons, but with civil, polite words and even some smiles here and there. No ice candy-wielding policemen appeared either, though, a rough indication that police and protesters viewed each other with wary eyes. When the protesters entered Batasan Road, the tune changed. Parts of the road thickened with police, and eventually military personnel dressed in fatigues and helmets and brandishing long-armed weapons started appearing in view. Many protesters looked at these soldiers – posted in every floor of the school buildings on each side – with apprehension and some fear. 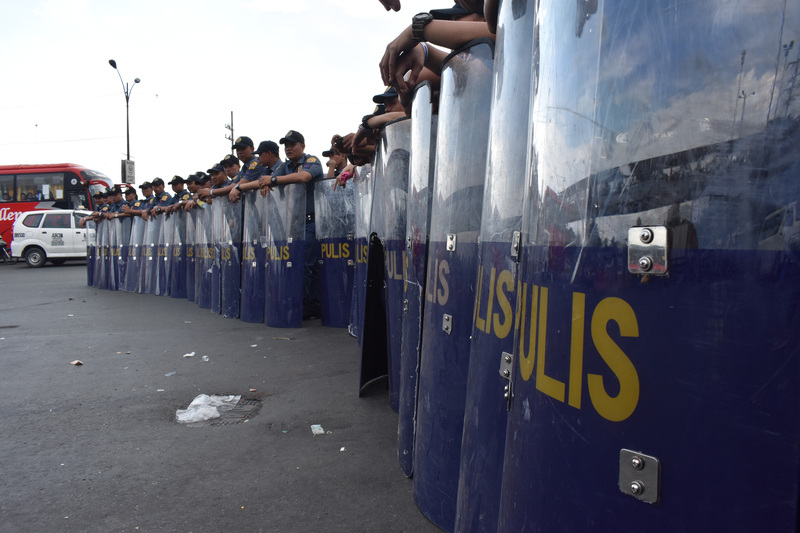 This, despite earlier announcements from no less than the Philippine National Police (PNP)’s chief Director Ronald “Bato” dela Rosa that there would be no weapons from government security forces in the SONA protests. 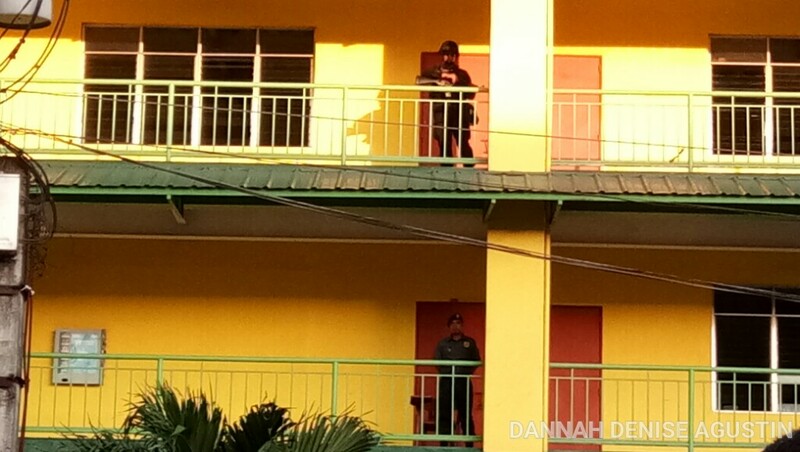 “Nakabaril sila ‘o,” exclaimed a woman clad in red, pointing at the military personnel with slightly shaking fingers. “Iba talaga ngayon, aba,” said another, with a subtle shake of her head. Some protesters became almost confrontational, too. “‘Kala ko ba walang baril? Mga siraulo ‘to ah,” a youth walking nearby remarked, cracking his fingers. His two friends walking beside him nodded to show their agreement. Someone nearby shouted an expletive at a police officer standing by, who did not so much as flinch or look at the direction from where the shout came from. “Never again! Never again! Never again to martial law! Did the President even hear them? The press conference he held right after showed he, too, was in a surly mood. The rains poured on.